Hello friends! A few days ago I posted a video where I shared my creative process and all the decisions (and indecisions) I make when I design a card. It was heartwarming to read all of your comments and feedback and I’m so happy you have found that video useful. Today I’d like to share something different, but something that in a way continues the topic of cardmaking – I’d like to share my go-to cardmaking formula, I call it a perfect cardmaking formula (only in a way that it works perfectly for me when I make Clean & Simple cards). I’m also sharing a way to replace one of the elements I use in my formula with something that can be found in pretty much everybody’s stash. 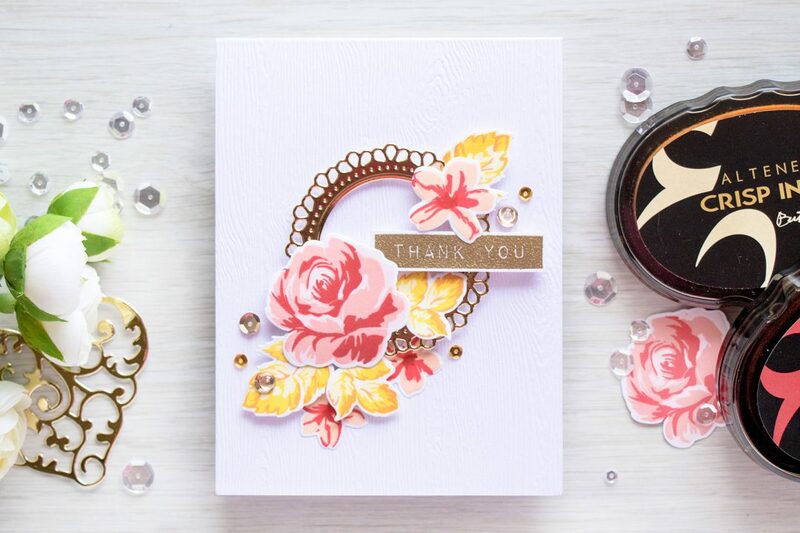 One of the elements in this formula, gold die cut, can be created using dies and gold mirror cardstock (or silver if you are a silver kind o girl). I pulled out my Spellbinders’ dies and experimented a bit to see what frames/dies cuts I could make for my cards. I only made 8 examples (I wanted to show them in my video and I didn’t want the video to be very long, showing 7 on photos below as the 8th one is used on a card), but I look forward to making additional examples using dies from Spellbinders and other companies. 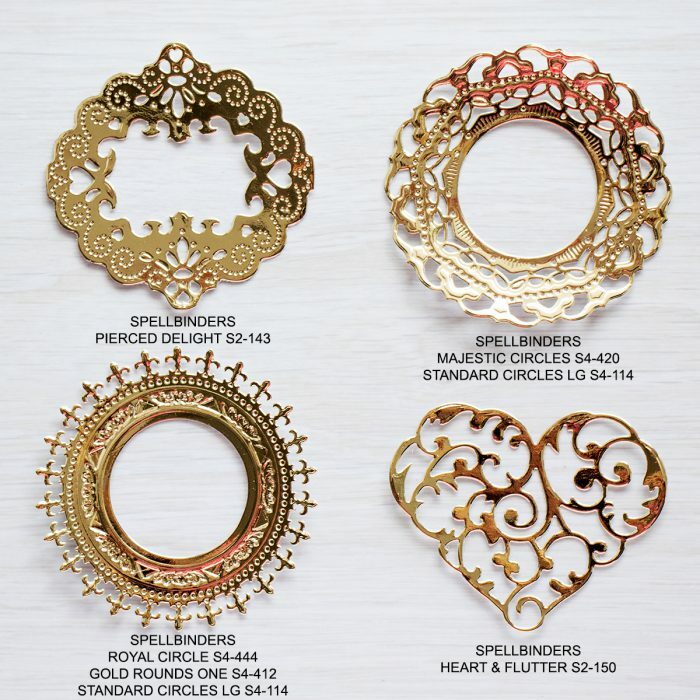 I chose Spellbinders to show as an example as they have very fancy and detailed dies and also because I have a lot of their designs (and I truly love their dies). See below the photos of the die cut + the names of the sets I used to create them. I also have all of these sets linked below. The frame I used for my card was created using a different set, Triple Tear. It is simple, yet elegant and I felt it was a perfect match for this project. To stick with my formula I went with white woodgrain cardstock from Simon Says Stamp (Altenew has identical card). For the flowers I used Altenew’s Vintage Flowers and matching dies. I did use a completely new color combo for me and I went with Peach and Yellow colors. 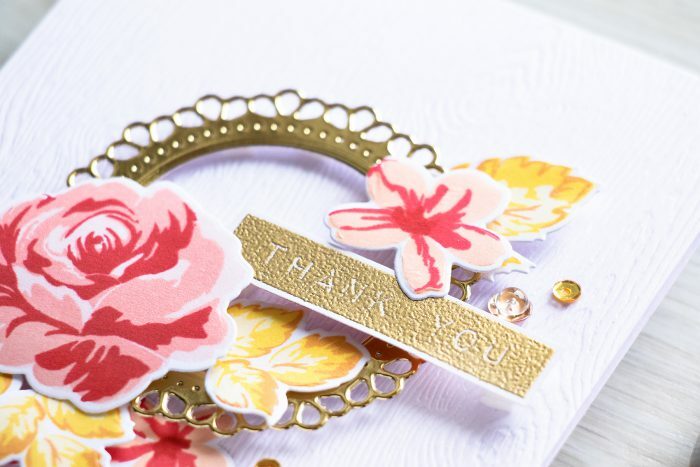 I used my mini MISTI stamping tool to stamp these and if you watch my video you can see how easy and quickly I was able to stamp two sets of flowers and leaves. I don’t use MISTI for all of my stamping, but it does work wonderfully for stamping color layering stamp sets and for stamping on textured paper such as watercolor paper. For the sentiment I used one of my all time favorite sets, Labels Love, and heat embossed Thank You in gold embossing powder onto white cardstock cut it out and foam mounted over the frame. I couldn’t resist adding several sequins and clear drops to finish this project. 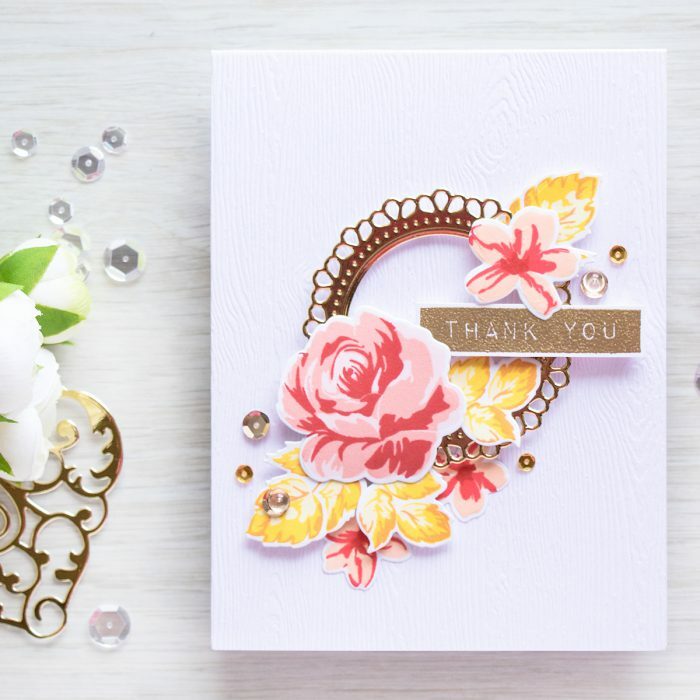 Thanks for the tip on using the gold foil paper to cut your dies. 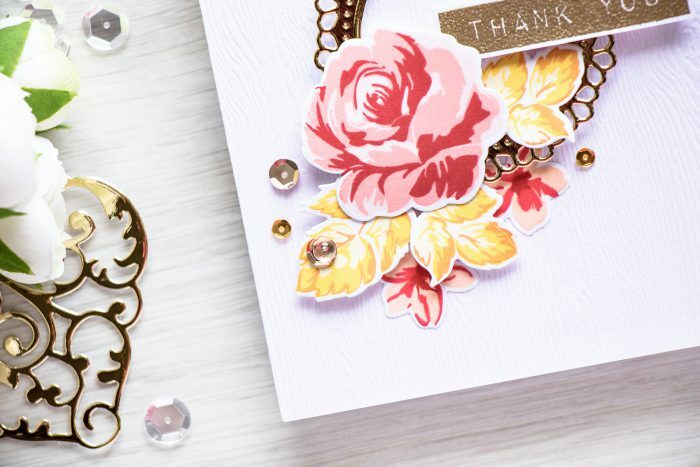 I love silver and plan to use my silver foil paper to make my next card. Love how yours turned out, Very clean a pretty! Thanks to Joan, at Dear Paperlicious blog, I am just finding this video and it is as fresh and informative as it was almost 3 years ago! Love your style and you have encouraged me to find my formula. Thanks SO much!